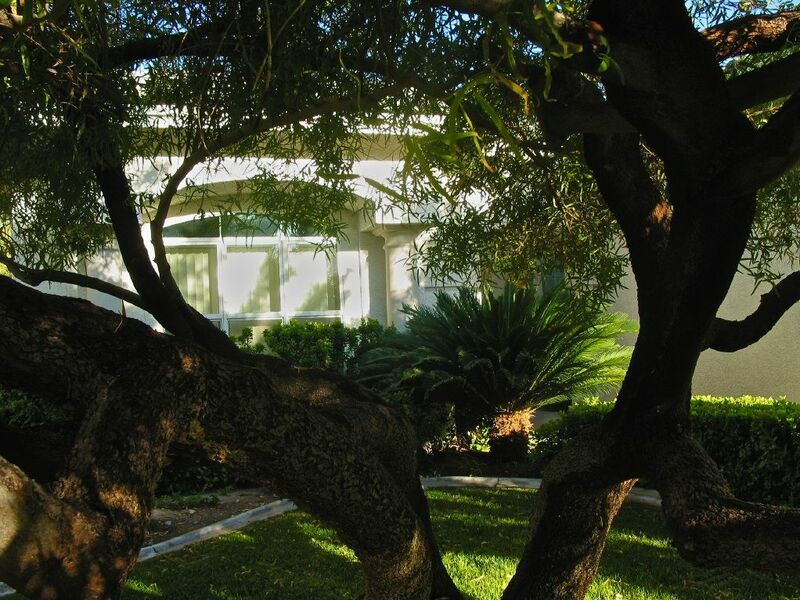 Our home has one of the most beautifully landscaped and secluded backyards in Las Vegas. The yard is ideal for private sunbathing, swimming in our pool or soaking in the spa in a Zen-like setting. The pool is NOT heated, however, the Hot Springs hot tub can be heated to the desired temperature year round. A large, covered patio with ceiling fans, glass-top tables, and a gas barbecue offers outdoor entertainment alternatives. You have your choice of dining in the family room in front of the HDTV, in the formal dining room under the palm fan, or outdoors under the covered patio. Turn on the pool and tree lights at night and the scene becomes magical. We have created an Asian Pacific/Tropical theme home with imported, hand-crafted furnishings providing an atmosphere of warmth and relaxation. Convenient to the strip and the airport in a private, gated community, this one-story home has a large master king-size bedroom, second and third bedrooms with queen-size beds, and a sleeper sofa in the living room. Formal living/dining rooms, large kitchen with island cooktop and barstools, breakfast nook, and family room. Amenities include a desktop PC with High Speed Internet access, a printer, an HDTV with HBO & other cable channels, a BluRay DVD Player, and a large covered patio with fans, and barbecue grill. Within walking distance to restaurants, grocery shopping, video rentals, and public park. Easy access to the Las Vegas Strip, airport, public golf course, and Red Rock State Park. 4 TVs. 1 in each bedroom & 1 in the family room. Outdoor Gazebo covered spa near the pool. PC with High Speed Internet Cable Connection, wireless router, HDTV with HBO & other cable channels, Blu Ray DVD Player with NETFLIX wireless access, and an IPOD/CD Stereo System. This vacation rental was perfect in every way. The hosts were thoughtful and responsive, the house was private and comfortable. I highly recommend Phil and Cindy! Quiet neighborhood, not far from the Las Vegas strip. There was a grocery store within walking distance from the house. It was too cold during our stay to use the pool in the beautiful private backyard, but we enjoyed the Hot tub very much. Good size kitchen, equipped with pots, pans etc. Dining table was large enough for the 6 adults in our group to enjoy a nice meal. Great communication with Owner. We had a great time. This house was perfect for our family with two children. It is conveniently located, close enough to everything. We strongly recommend it to any family visiting Las Vegas instead of a hotel. We had a wonderful time at this lovely home and it truly is an Oasis. After a long day seeing the sights there is no better place to relax and enjoy the shaded pool. The owners were helpful and easy to contact. You can't go wrong if you choose this wonderful home for your vacation retreat. Every day it was the same dilemma — relax in this beautiful backyard or go to the Strip. Neighborhood Restaurants, Grocery Stores, Video Rentals, Starbucks, within walking distance. Rates are negotiable and subject to change until rental is booked. Rental rates vary depending on the season, the number of guests and the number of nights booked. There is a $250 refundable security deposit that can be covered by credit card or check. Extended stays beyond 7 nights are negotiable. Owners will consider stays less than 4 nights on a case by case basis depending on availability. Feel free to inquire.